I rarely go for eye creams. The reason for that is I usually buy a moisturizer that I can use all over my face, including on the eye area. But about two months ago I decided to finally purchase the eye cream as the skin under my eyes had got a lot worse. Too much stress, dehydration, lots of (forced) laughing and smiling (forced especially when you meet new people and want to come across as nice and friendly, you’re having the worst day of your life but because those new people are important, you just glue the smile to your face). So, enough of moaning, I bought this eye cream because I thought it’s high time I finally did it and the timing was about right to rescue my eye area. So what I did was I went straight away to my favourite online k-beauty store (roseroseshop.com) and found the cheapest (I know!) and the most appealing eye cream I could find within a few hours (it took me ages, to be very honest). But ultimately I found Collagen Power Firming Eye Cream by Mizon and I was delighted by the purchase. So here’s the review of the product and my thoughts on its performance. I didn’t find much on the Internet about the eye cream either in terms of reviews so I thought that I’d just find out about everything by using it myself. So when it reached my door, this is what it came in. It came in a small cardboard box in which there was a slim tube of the cream. Initially, I thought that it’d last me max. 2 weeks as the tube was tiny but somehow, after 2 months of using it regularly, I still have some left. O.O Here’s what was inside. Because the packaging didn’t have any ingredients list in English, here’s the one I found on CosDna (and which I used to see if the eye cream was worth buying before I actually did it). It looks really decent- contains Collagen, Sodium Hyaluronate, Adenosine, some peptides, plant oils and extracts and Beta-Glucan. Seems like a really nice blend. When it comes to a texture, it’s more like an eye GEL nor an eye CREAM. It’s transparent, has no scent (literally- no scent), and is really easy to spread. When I saw it, it seemed like an eye cream made perfect for me. But it turned out it has some… drawbacks. Let’s start with what I liked about the eye cream. The Collagen Power Firming Eye Cream by Mizon certainly appealed to me in terms of the gel-like consistency that is easy to spread, absorbs really quickly and sits well under my physical sunscreen. When I applied it on my face, after a few minutes, there was no trace of it- it absorbed entirely and left no scent. I also really liked the ingredients it contains- the list is full of skin-friendly stuff that should do wonders to your skin. Unfortunately, the eye cream didn’t do wonders for mine. It did moisturized my eye area pretty well but it didn’t eliminate or diminish the tiny wrinkles I’ve had around under my eyes. So I can say it didn’t live up to the first part of its claim (lifting wrinkles around the eyes). Has my skin become more elastic? Hard to say. Maybe. I didn’t notice that many new wrinkles since I started using it so maybe it did improve my skin elasticity to an extent. But my skin is quite young anyway. And I try to eat healthily. So to attribute the no-new-wrinkles solely to the working of the eye cream would be an exaggeration. That’s all from me. Have you tried this eye cream? If yes, what do you think about it? I was shopping (again) at TKMaxx (again) and I found this Nature Republic Himalaya Salt Cleansing Balm. And because I love Korean products, my previous cleansing cream was almost gone and Nature Republic triggers positive associations in my head, I had to buy it. Truth to be told, it was much more expensive than The Face Shop Herb Day Cleansing Cream with Green Tea (even though the price was already reduced) but I….just had to buy it. So I did, and so today there’s another review. *it should be pleasant to the skin (in texture, that is). Did it live up to its claims? I shall talk about it more below. The cleansing balm comes in a round plastic packaging which in turn comes in a little cardboard box. The plastic packaging is very smooth, opens without any problems and stores the balm perfectly. Can go anywhere or fall down and it won’t break and the balm won’t spill all over. Thumbs up. There’s also a small scoop inside to facilitate taking about the balm itself. Quite handy but bare fingers should suffice as well. To be fair, the ingredients list disappointed me quite a lot. There are only three plant extracts which, compared to The Face Shop cleansing cream, is nothing. But there’s Mineral Oil as the second ingredient on the list so I thought the balm itself would do the job and cleanse effectively- and that’s the most important thing when it comes to cleansing stuff. You can also see the ingredients list here. When it comes to the texture, it’s very soft and even though when you open it for the first time it may look veeery solid, it’s actually easier to spread on the skin than most moisturizers. When it touches your skin it almost instantly becomes an oil-like transparent spread. So it’s perfect for a skin massage while cleansing. As with The Face Shop cleansing cream, I decided to do an experiment and see how effectively the balm removes makeup. So I put long-lasting lip gloss, two lipsticks and mascara at the back of my hand, let it dry a bit and then applied the Nature Republic cleansing balm. After massaging in the balm for a few minutes I wiped it off with a face wipe. These are the pictures. It was really effective when it comes to the lipsticks and the lipgloss. But with the mascara it wasn’t that easy. The Face Shop cleansing cream did a better job of removing it than did Nature Republic cleansing balm. So, despite the balm’s claim, if you wear ‘heavy’ makeup you may have difficulties in getting rid of it. It is moisturizing, though. Moisturizing in a way that it doesn’t leave your skin dried out. Most likely it’s due to the Mineral Oil it contains- definitely not any plant extracts. It didn’t break me out or clog my pores either (a plus as I have a sensitive and easy clogging skin). If you’re looking for a decent affordable cleansing balm/cream, Nature Republic Himalaya Salt Cleansing Balm is an option, but there definitely are better alternatives. I won’t purchase it again, at least not as long as I can see something else on the shelve which is the same price or cheaper. The balm didn’t live up to the most important claim- effective cleansing. It is, however, moisturizing and it definitely ‘melts like a sorbet’. How about you? Have you tried this cleansing balm yourself? Leave a comment below! Also, stay up to date with the blog posts by clicking on the Follow button in the right upper corner of the Home page or, alternatively, you can follow me on Facebook or Instagram. So, recently I’ve been living quite an intense life, having lots to do and moving around a lot. In the last post I mentioned the amount of workload and time pressure. It’s made me physically (and mentally) tired which obviously had an impact on my skin. It started to look dull and unhealthy. So I decided to take care of myself more, especially of my skin. So I ordered a few goodies from a Korean website (RoseRoseShop), a goodal Green Tea Infused Water Mild Sheet Mask being among them. I put it on yesterday and I absolutely loved it. To say something more about it, here’s a review. ‘Moisture charge: Fresh Camellia Sinensis Leaf extract (Green Tea) obtained by the fresh lock processing charges skin with moisture. Gentle mask sheet: 100% environmentally friendly pure bamboo mask sheet adheres comfortably to the skin. Pure water: The ”Pure water” obtained after a 7-step purification process is safe to use on sensitive skin by removing harmful impurities from water’. So basically what’s so appealing about the sheet mask is that it’s gentle even on sensitive skin, moisturizing and environmentally-friendly while not compromising on the quality and convenience of the use. Below, I’ll review the mask against those claims. As I was in a really bad mood yesterday, the only thing I wanted to do was rip off the mask’s packaging and put it on my face. Hence the picture of it after the opening (I’m so sorry for this fragmentation!). I absolutely looove the ingredients list. As almost all of goodal products, it’s really impressive and skin-friendly. It has lots of beneficial plant extracts (such as Green Tea Extract- third on the list so there’s loads of it!) and there’s also Hyaluronic Acid in two forms -Sodium Hyaluronate and Hydrolyzed Hyaluronic Acid- which gets the mask 10/10 from me as Hyaluronic Acid provides moisturization in itself but having it in two forms moisturizes the skin even better as it gets absorbed by the skin more! In the ingredient’s category it’s a win-win sheet mask. When it comes to texture, oh my god… I can’t even express how much I loved it! It was the first bamboo sheet mask I tried but can already say it’s one of my favourites. It is extremely soft (and also fragile) and adheres incredibly well. Usually when I put on a sheet mask I have to put in a lot of effort to get rid of the air bubbles that form beneath the mask or the creases that form when I’m trying to cover with it as much of my face as possible. But goodal’s sheet mask was so easy to apply and I didn’t have to do much to make it adhere to my skin thoroughly- without any air bubbles or creases. I’m telling you, that sheet mask is my star. goodal Green Tea Infused Water Mild Sheet Mask is truly moisturizing. After taking it off, my skin was highly moisturized but not sticky as most sheet masks leave my skin. It was moisturized, soft and I could clearly see a difference in my skin’s condition. It looked healthier straight afterwards, but I could see the real result the next day as well. When taking photos I didn’t have to use any filters or adjust the lighting to make my face look bearable to look at. Here’s the proof (normally, my skin looks much much worse). I took two pictures- from the front or ‘selfie’ camera (first picture) and the back one (second picture). There was not much difference between the look of my skin, though, although normally the ‘selfie’ camera makes my skin look smoother, making all the imperfections less visible. But after using the goodal’s mask, there was no need to worry about my skin looking fine. It fulfilled its purpose. By the way, I’m sorry for a little shadow on my face in the second picture- I couldn’t find an angle to get rid of it and show the face as clearly as possible. The end result of using this mask was certainly due to its amazing ingredients. It contains active and effective elements without any harmful ones which makes it perfect for the sensitive skin. Here’s the proof. Its effectiveness is further enhanced by its extreme adherence to the skin so that all the ingredients can penetrate the face skin evenly. However, when it comes to the environmental and water purity aspects of the sheet mask I don’t have any means to check their factuality. So I’m going to leave it to the people that can actually fact-check them. At the end of the day, the sheet mask lives up to its claims. It’s truly moisturizing, enhances the skin’s appearance and doesn’t cause irritation (at least in my case- always double check if it doesn’t irritate your skin). I loved this sheet mask. And I’d definitely purchase it again. Now it’s your turn to share your thoughts. Have you tried this sheet mask before? If yes, what’s your opinion? Leave a comment below! Also, you can stay up to date with the blog posts by clicking on the Follow button in the right upper corner of the Home page or, alternatively, you can follow me on Facebook or Instagram. I’ve been thinking about it for quite a while and I’m sad to announce that I have to suspend the normal blog postings schedule for a time being. It was really hard to make this decision as I do enjoy blogging but I’ve been faced with a chronic lack of time. I’ve been faced with a huuuge amount of uni workload and I’ve already started preparing for my final year exams. I also work part-time and recently I’ve been given a lot of overtime which, on the one hand, I need and which on the other takes away some my precious time and energy. I’ve been pushing myself to keep posting here but I became so stressed out and mentally and physically exhausted that I’ve begun to fear writing new blog posts might cease to be enjoyable and become to feel more like a duty. And I definitely don’t want that to happen. That’s why as for now new posts won’t be appearing relugarly on Wednesdays and Sundays as it was up till now. I’m not suspending the blog, however, so new posts will still keep appearing. I’m not able to say as to when they will be published, though. So keep your eyes on the blog and keep checking it regularly. How about you? Have you tried this cleansing cream before? What are your thoughts? Leave a comment below! About two weeks ago I published a post on double cleansing. I mentioned how I substituted normal olive oil for a cleansing balm/oil and put it on a cotton pad to get rid of makeup and how you could do the same. At the end of the day, any makeup remover would do to remove the mascara and the foundation (or whatever else you might be wearing), and then use (any) normal cleanser if you’re into double cleansing. But the thing is, most of the Western makeup removers are quite harsh to the skin (most of them contain a lot of alcohol- and the same goes for toners) and using cotton pads to remove makeup can be irritating to the skin. The Korean way of cleansing (the double cleansing) is a much better way to remove any makeup (even the waterproof) and any dirt/sebum that’s left on your face after the long day. In their skincare routines, Koreans (or anybody who follows k-beauty/Asian beauty routines) use cleansing balms and cleansing oils as the first step of double cleansing and then proceed with a foam-based cleanser. What’s the difference between the cleansing balms and the cleansing oils though? Most of the cleansing oils I’ve known emulsify under the water. So when you use a cleansing oil as the first step in your cleansing routine, you will probably have to rinse off the cleansing oil of your face with water. The cleansing balms, on the other hand, don’t necessarily require that. You can remove them with makeup wipes or a tissue/towel so there’s no need to involve water here. As for me, it’s much more convenient since it enables me to remove my makeup in the comforts of my bedroom and, if somebody’s in the bathroom (for a long time), I can still start my cleansing routine. The cleansing balms are also more solid, in contrast to the cleansing oils that are, well, liquids. So there’s always a possibility you can spill it somewhere when applying it onto your face. I suggest doing it under the shower or over the sink as I guess nobody would like an oil stain on one’s clothes or carpet. As already mentioned, the cleansing balms are solid and because of that, it’s a bit harder to apply them on the face as you have to warm them up to be able to spread them easily. Nevertheless, either of the two will clean your face and help you get rid of any impurities and makeup. There are also products that are somewhere in between- recently I purchased a cleansing cream. It’s not as solid as the cleansing balm but not as ‘liquidy’ as the cleansing oil. It’s been working fine on my face so it’s a good alternative if you’re neither into cleansing balms nor cleansing oils. Just for illustrative purposes, here are some pictures of my cleansing balm and cleansing cream, and a picture of a cleansing oil (taken from the depths of the Internet). I haven’t used the Nature Republic’s Himalaya Cleansing Balm yet so the contents may look creamy. But it’s as stiff as frozen butter. That’s why there’s a little spatula attached to the lid to make it easier to take some the balm out. I can’t wait to finally try it out and see how it works on my skin. I’ll definitely post a review here (since I myself could find few on the Internet) once I used it for some time to see its effects. Have you ever tried a cleansing balm/oil? Is so, what’s your favourite? Any suggestions as to what cleanser I should buy next? Leave a comment below! Also, you can follow the blog by clicking on the Follow button on the Home page or, alternatively, you can follow me on Facebook or Instagram. A student. K-Beauty fan. Skincare addict. An expat. 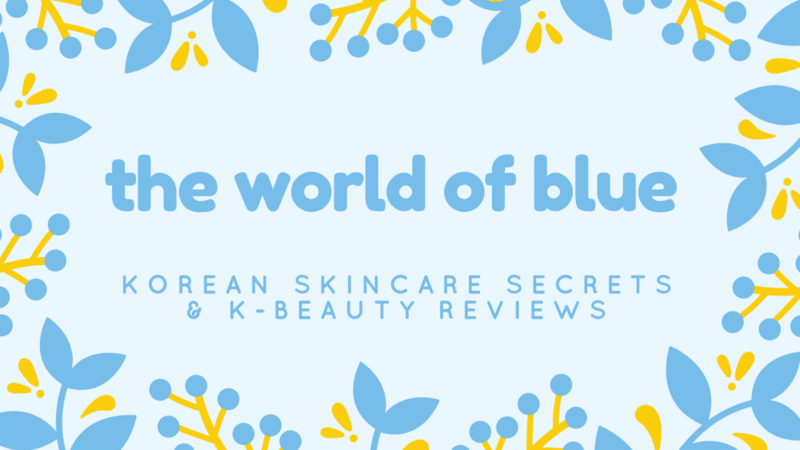 Blogging on all things (Korean) skincare related. Join me on the journey of discovering what the world of skincare has to offer! Be up to date and don't miss any new posts. Click on the Follow button!